Ross Keymer has been a key man for Ufford. Ufford Park will play Cambs Leaue cricket for the first time next summer after a nerve-jangling final day of the Hunts Division One season. Ufford started the day with a 12-point lead over the only team with a realistic chance of catching them, Ramsey seconds. A win over neighbours Burghley Park would have confirmed Ufford’s promotion, but eight bonus points were required if they lost and Ramsey won. 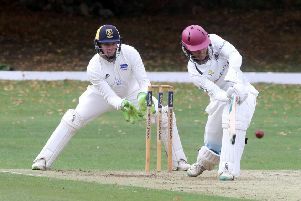 Ramsey did their bit by powering to a rapid nine-wicket win at Waresley seconds (‘The Rams’ dismissed their nine-man hosts for just 38) and Ufford looked in trouble when only taking three wickets in the first 35 overs of Burghley’s innings. Fortunately opening bowlers Joe Harrington (4-37) and Joe Corder (3-35) returned to take seven wickets in quick time as Burghley were dismissed for 215 and Ufford collected five bowling points. Ufford now needed to score 150 to seal the title and 49 from Harrington and 47 from Ross Keymer ensured they did despite a 7-56 spell from Stuart Biggs. Chris Meadows had earlier struck 64 for Burghley. Ufford eventually lost by seven runs, but they were still able to celebrate a place in the highest standard of cricket in their history. Keymer finished as the top division’s leading run scorer. He made 832 runs at an impressive average of 104, striking three centuries and three other scores over 50. Team-mate Andy Larkin contributed 593 runs for second place in the run charts. In Division Four an eight-man Castor second team put on a defiant show against Ramsey thirds before going down by four wickets at Port Lane. Skipper Andy Johnson contributed an unbeaten 43 of Castor’s modest total of 105, but the home side took six wickets before accepting defeat. Veteram Norman Gray bagged four of them. Harry Buddle claimed 3-32 for Ramsey. Ramsey’s hopes of a late push for promotion were dashed by the abandonment of their Bank Holiday Monday fixture. Hampton thirds incredibly managed to complete a fixture last Sunday when the rest of the local cricket programme was washed out. Buckden seconds emerged victorious by seven wickets in the Division 5B match thanks mainly to an unbeaten 105 from Alex Marsh. Ian Winters (42) and Muhammed Zafar (36) scored best in Hampton’s 160. Bretton have finished top of this division.